I finally did it, and you too can just delete your Yahoo account, full of security holes and blunders. “Only old people have Yahoo accounts,” I finally told my daughter. Yes, it was a bit underhanded, but really? 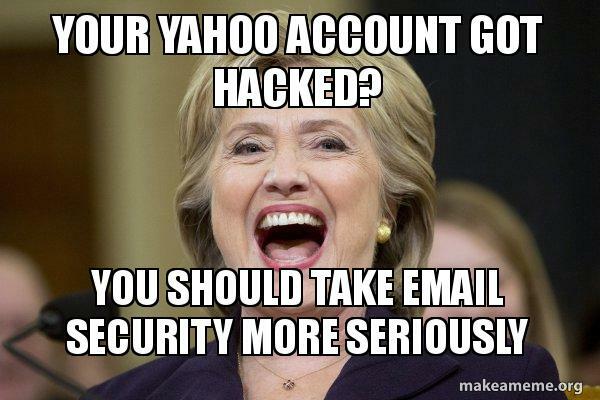 I’ve been trying to get her off of Yahoo for at least 3 years, and this last security breach, in which they told no one about until forced to reveal it, was simply the last straw. So, I waited for her to delete it, and waited, and waited, and finally one day after I didn’t hear back from her, I removed all subaccounts. Here’s the problem, though, and it is why I’ve wanted for over five years to get rid of it: It was an ameritech.net address, and it was tied to all sorts of things that it should never been associated with. I couldn’t just sign in and remove the main account, either. I had to call someone. Of course, I no longer had an “account number”, since I did not have an account!! Persistence prevailed, however, and she gave me a different number (but the wrong options, it would appear) that led me to someone who resets forgotten passwords. She then led me by the hand (because of the sprawling spaghetti that is Yahoo and then AT&T accounts) to the right page. Even then, I had to squint to see “Delete account”. I could not have done it without her assistance. Indeed, the game is rigged to tie you to a Yahoo account forever. Anyhow, goodbye, bad rubbish! I recommend anyone who has a Yahoo account do the same. It’s time to seriously consider deleting your Yahoo account. Can’t? OK, here’s what you can do to protect it.